At 28, Macey Hoaglund was told her symptoms may be due to ALS. The uncertainty brought her to Mayo Clinic, where she's still looking for answers but has already found hope. Macey Hoaglund sat in the doctor's office, stunned by what she'd just heard. 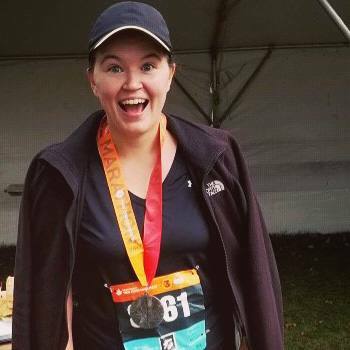 A few months earlier, Macey had run the Twin Cities Marathon. Slower than she'd wanted, sure. But still, she'd crossed the finish line and received her medal. Now the 28-year-old was listening to a neurologist tell her that the stiff muscles and ankle problems she'd been experiencing weren't related to her training, as she'd suspected. Instead, the doctor told Macey there was "a 90 to 95 percent chance" she had ALS — and just two to five years to live. Macey was devastated. And terrified. The doctor told Macey she'd need additional testing to confirm the diagnosis, "but nothing was available for a month," Macey tells us. "I tried hard to block it out, but I couldn't work, couldn't eat." That's when she decided to seek a second opinion at Mayo Clinic. "Walking into Mayo was the most scared I've ever been in my life," Macey tells us. But at Mayo, she found something unexpected: hope. She met with Nathan Staff, M.D., Ph.D., a neurologist who "held my hand and told me he was going to redo all of the tests I'd had and take another look." After several days of testing, the results weren't quite so clear. Though Dr. Staff wasn't able to rule out ALS, he wasn't ready to confirm it, either. It was possible, he told Macey, that something else was causing her symptoms. Macey says the search for an answer continues, and she'll undergo more testing. But she's taking some comfort in knowing the answer is still to be determined and that she's in the right hands. "For now, it's a medical mystery," Macey says. Until that mystery is solved, Dr. Staff recommended Macey meet with a physical therapist and try Pilates to help deal with her symptoms. Macey tells us she's doing both, and more. 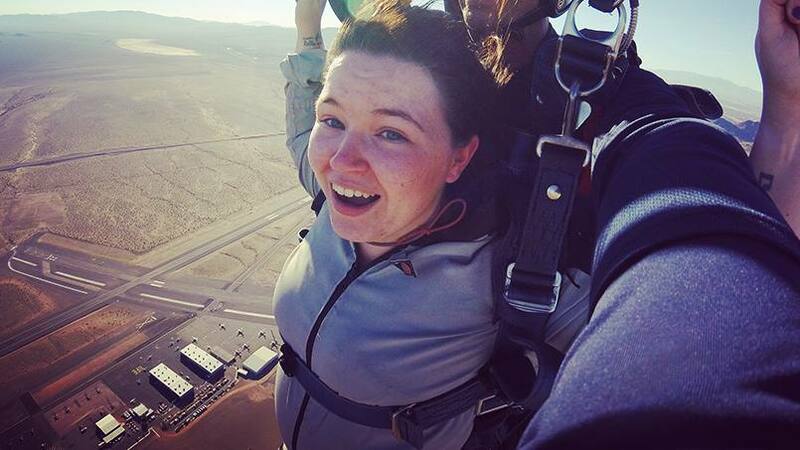 She and her parents recently took a trip to Las Vegas, and while they were there, went skydiving. The experience has given Macey a new perspective. "It made me realize how big the world is," she says. "My problems are big, too. But if I can run a marathon and jump out of a plane, there's not a lot I can't do." Especially with the right team behind her. "Everyone at Mayo, from the people who check you in for appointments to the people performing the tests, has been so comforting," Macey tells us. "Dr. Staff has been very transparent with me. If I have a question, he gets right back to me. If it does turn out that I have ALS, I have 100 percent faith that they'll take care of me." That's a comfort to Macey's mother, Joleen Peterson, as well. "Our emotional rollercoaster ride is far from over, but I am confident she is receiving the best care possible," Joleen, who works in Documentation Services at Mayo, tells us. "Knowing that helps a mother sleep at night." You can leave a supportive comment and get updates on Macey's journey here. Then leave us a supportive comment below before you use the social media tools to share this story with others. Check out Mayo Clinic's Department of Neurology. Macey is such a fighter and I am so proud of her skills in coping with this entire process. Mayo Clinic is one of the preeminent health care institutions and I am sure she'll be able to get the right support. Prayers for Macey..
First to say I'm very saddened by the trials and unknowns you are now living. I had a devastation of news 13.5 years ago. Mine was A.S. Ankloysis Spondilitis. To hear that you have something so life changing has no words. You only have to things "God" and "hope". From thinking I wasn't going to be able to care for my children, walk or see correctly was devastation. Hope carried me through many struggles. I tell you this because I never gave up searching, never stopped praying, never believed I could find an answer. NEVER GIVE UP! Live life to its fullest. Believe in you and others working for you. Macey, I will pray that it's nothing serious that they initial exam was wrong. Miracles can happen! Keep strong sweetie. Macey is one of the bravest people I know with a positive attitude. She won’t give up! Good luck, Macey and I’m pulling for you!